Dans la prairie (1876) by Claude Monet; Sold for £11,241,250 ($16,104,942), against estimates of around £15 million. Image via Artnet. “It was a great sale and brought back a lot of confidence to the market.” Leon Benrimon, in remarks to ArtInfo. Christie’s evening sale of Impressionist and Modern Art, held February 4th, has been hailed by some as a confidence-building event which demonstrated that there is some vitality left in the art market, while others give credit for the auctions ostensible success to high quality pieces (often being auctioned for the first time in decades), along with low estimates and low expectations. The auction realized a total of £63.4 million or $91.2 million, well within its range of £58.8 million to £86 million. In the course of the evening, 39 of 47 lots were sold, with 4 lots sold for over £5 million, 16 for over £1 million, and 25 for over $1 million. According to Christie’s, 54% of the works were bought by European bidders, 26% from the U.S., 18% from the U.K. and 2 percent from Asia. Dans la prairie, by Claude Monet, was the highest priced lot of the night despite falling below its expected range. The painting, which was exhibited for the first time at 1877’s seminal Impressionist Exhibition, sold for £11.2 million, or $16.1 million–while the range for the painting was unpublished, it is thought to be somewhere in the £15 million range. 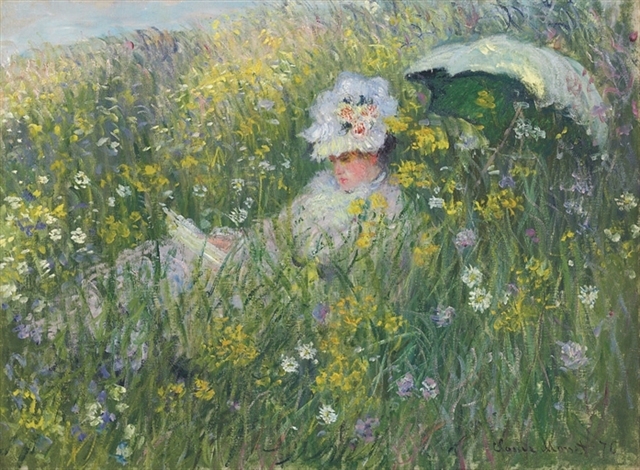 Dans la prairie‘s subject is Monet’s wife, Camille, reading in a meadow in Argenteuil, a few kilometers north of Paris. It was bought in a single telephone bid made by Anika Guntrum, a Paris-based Christie’s specialist, on behalf of an anonymous buyer. L’abandon (Les Deux Amies) (1895) by Henri-de Toulouse Lautrec; £6,201,250 ($8,884,312) against estimates of £5million to £7 million. 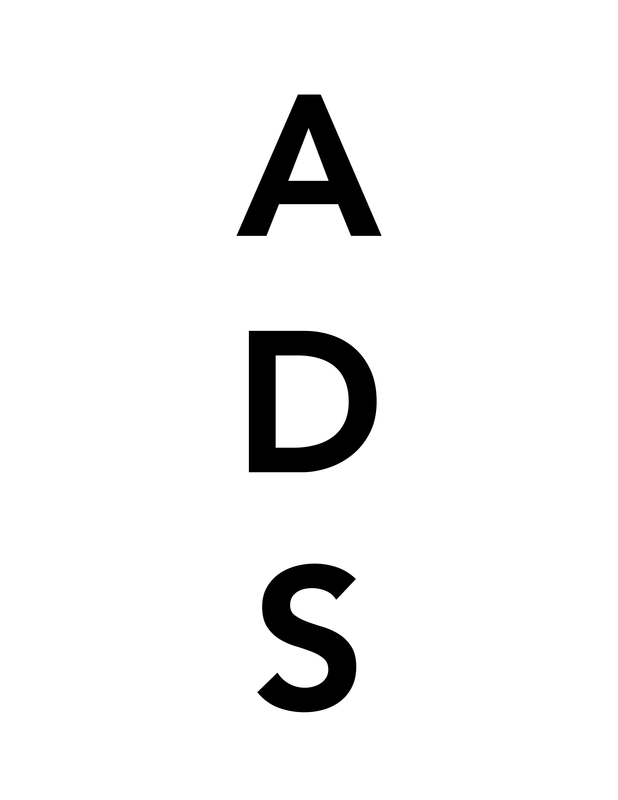 Image via Artnet. There were, however, very notable successes, where high estimates were exceeded. 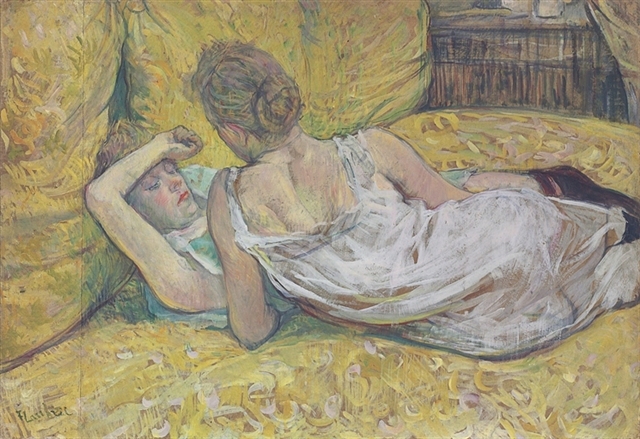 L’abandon (Les deux amies) by Henri Toulouse-Lautrec, which portrays two girls lying on a bed in a brothel sold above its £5 million low estimate, also going to Anika Guntrum for £6.2 million. Henry Moore’s Reclining Mother and Child sculpture beat its high estimate of £2 million, selling for £2.6 million. Dame en face mit plisiertem Kleid (Damenbildnis en face), a painting by Gustav Klimt dating from 1898, sold for £1.38 million, well beyond the £800,000 high estimate. 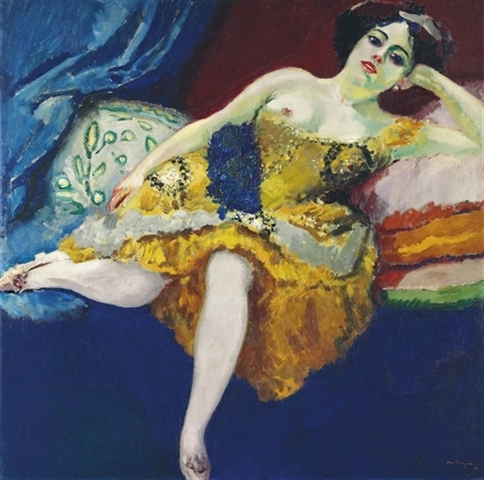 Several works by Dutch Fauve artist Kees van Dongen also garnered substantial interest. Four paintings by that artist depicting prostitutes were sold for an aggregate of £6.4 million against a low estimate of £4 million; La cuirasse d’or, one of the four paintings, sold for £2.9 million against high estimates of £2.5 million. Femme aux deux colliers, also in the series, £1.3 million against high estimates of £600,000. 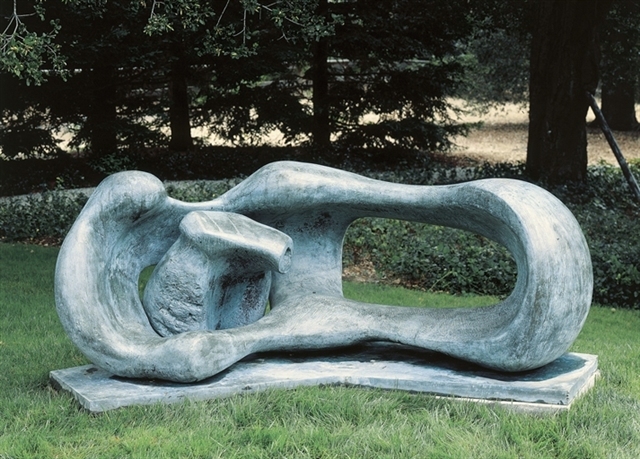 Reclining Mother and Child (1960) by Henry Moore; sold for £2,617,250 ($3,749,641) against estimates of £1 million to £2 million. Image via Artnet. La cuirasse d’or (1907) Kees van Dongen; sold for £2,897,250 ($4,150,787) against estimates of £1.5 million to £2.5 million. Image via Artnet. Modigliani’s Les deux filles reached £6.5 million topping its estimate of £5.5 million, after bidding by three collectors drove the price up. Having never appeared at auction before, the canvas is also unique for being one of only five double portraits the artist has ever executed. A lower priced lot that handily surpassed expectations was Ernst Ludwig Kirchner’s double sided Drei Pferde / Landschaft, which sold for £959,650 on estimates of £300,000 to £500,000. 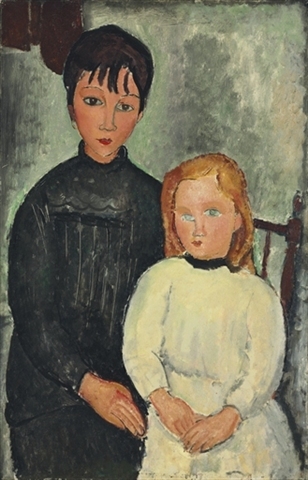 Les Deux Filles (1918) by Amedeo Modigliani; sold for £6,537,250 ($9,365,687) against estimates of £3.5 million to £5.5 million. Image via Artnet. 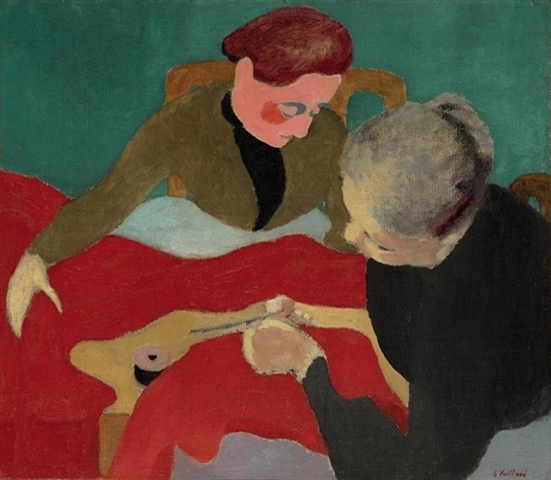 Les deux couturieres (1890) by Edouard Vuillard; Sold for £5,081,250 ($7,279,727), against estimates of £4.5 million to £6.5 million. Image via Artnet. Edouard Vuillard’s Les deux couturieres landed inside its estimate range of £4.5 million to £6.5 million, sold on a single bid for £5 million. Souren Melikian of the International Herald Tribune speculates that the piece may be unfinished–it is uncharacteristically lacking in detail for the aesthetic status quo and the period of Vuillard’s life in which it was painted (1890), and was only revealed to the public when it was sold by the artist’s estate fifty years later. 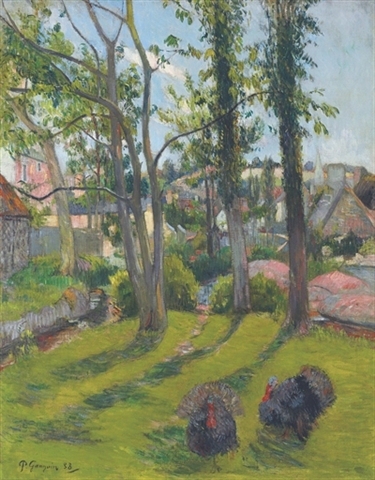 While there were some prominent unsold lots by household name artists such as Matisse, Renoir, and Monet (his Promenade at Argenteuil failed to generate any bids), the auction performed well enough to merit being called a success. 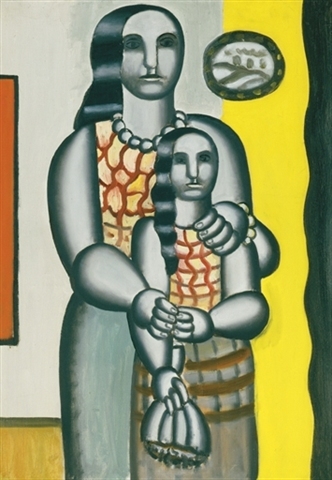 Les deux soeurs (1929) by Fernand Leger; Sold for £2,169,250 ($3,107,808) against estimates of £2 million to £3 million. Image via Artnet. Les Dindons – Pont-Aven (1888) by Paul Gauguin; Sold for £2,057,250 ($2,947,349) against estimates of £2 million to £3 million. Image via Artnet. This entry was posted on Thursday, February 5th, 2009 at 5:18 pm	and is filed under Art News, Auction Results. You can follow any responses to this entry through the RSS 2.0 feed. You can leave a response, or trackback from your own site.